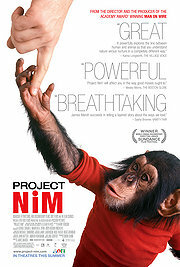 Well hyped for the Oscar season last year (and one of the prime snubs when it did not even get a nomination), “Project Nim” documents the fate of a chimpanzee, more or less from cradle to grave. To a certain point, that story has been seen last year in “Rise of the Planet of the Apes”: taken out for experiments for sign language, Nim is in a long-term programme under the supervision of one university institute, but with varying foster families. These families are the actual “stars” of the movie… as it was a research project, all is well documented by video, and some of the people involved have been interviewed for camera today. There are all kinds: morons who believe that you can, or even should, raise an animal the same way you would a human child, there are animosities and jealousies especially between the female participants, there are hippies who just think this is way cool a way to spend your uni assignments, there is a hedonistic yet mostly realistic professor who keeps believing in the research aim, but who does not have a problem to cut off the whole thing when it’s clear that nothing of scientific use will come out of it anymore. Between all these interests and emotions sits that ape, being tortured and abused for other people’s causes. He seems to bloom for a while, but it also becomes clear that many of the stories about affection and interaction the interviewees talk about seem to the mere fads of their imagination. As a document of this project, “Project Nim” is quite interesting. As a film, a piece of art, I did not find much to admire. In this, it reminded me of the other film I have seen by James Marsh, “Man on Wire”, which was quite fascinating as a story to read about in the newspaper, but ran out off steam after half an hour into the film. Similar here: you get the idea soon enough of what is wrong with the concept of a wild animal as baby substitute, and not too many surprises come after that.